a heart surrendered: A heart of anger can be HEALED! An excellent resource for all parents, and a worthy read for anyone who struggles with the sin of bitterness, anger, stubbornness, or rebellion. The root of anger is a seed that is usually planted when we are hurt or wounded and when left unchecked and unresolved it grows quickly into bitterness, which we know is a sin that must be destroyed. I read this a decade ago and found it timely and helpful then, and the lovely woman who is discipling me assigned me to read it again this month. I read the entire book in one day, highlighted everything that jumped out at me, and sent her my responses in four separate e-mails. Not only do I see my children in the words running across the pages - I see myself. And the image is not attractive. Praise the Lord for being a God of forgiveness, mercy, and second chances, for I need them all. Every day! I am including many of the quotes that challenged/convicted me with the hope that someone else who struggles with an angry child or an angry heart (or both) will be encouraged that a) you are not alone and b) there is HOPE - for healing, and for PEACE. In your home, and in your heart. - God will not ask you as a Christian to follow any biblical mandate without providing the grace and ability to carry it out. - Identify how you may be sinning against your child so you can remove the beam from your own eyes before attempting to remove the splinters from theirs. - Because the Bible addresses all aspects of communication, the Christian should make it his goal to become proficient in all three areas. Words - non-verbal communication - tone of voice. - When a man is angry (or experiencing other intense emotions), he is at greater risk of sinning with his words. Great verses to fight this! - The effect of tone of voice is so great that some experts believe it to be up to seven times more powerful in certain situations than the words themselves. - Changing facial expressions is probably the most difficult aspect of communication to correct. - What is the first rule for disciplining children? You must have more discipline than the child. - The Gumnazo Principle: Correcting wrong behavior by practicing right behavior, with the right attitude, for the right reason, until the right behavior becomes habitual. - Confessing one's sin to an offended brother is not simply an option for a Christian, it is a command that you must follow if restoration is to occur. - Asking for forgiveness is not the same thing as saying, "I'm sorry." Saying "I'm sorry" doesn't accomplish the biblical goal of putting past offenses aside. Nor does it lay the foundation to reestablish a broken trust as effectively as does asking forgiveness. - When someone forgives, they are committing not to hold it against the person, talk about it with others, or dwell on it themselves. A Christian is commanded by God to forgive a penitent offender. The offending Christian has the responsibility to earn back the trust that has been lost as a result of his sin. Granting someone forgiveness is not the same thing as declaring someone trustworthy." - Just as your children must practice biblical communication principles to become proficient in their usage, so you, as a parent, must practice biblical discipline to become a proficient and skillful instructor. - The ability to discern thoughts and motives when experiencing intense emotion is an essential skill for the Christian who intends to pursue holiness. Recognizing thoughts and imaginations of the heart is a prerequisite of bringing them "captive to the obedience of Christ." - The best evidence that a Christian desires (loves) something more than he desires (loves) God, is his willingness to sin against God, either in order to acquire that desire or because he cannot acquire it. One of the most common sins that demonstrates the presence of inordinate desire is anger. - Christ never answered a fool with a foolish response. He never fought folly with folly. In communicating with fools, He never employed communication forms that violated Scripture. Although He did respond to foolishness, He did not respond in kind. In other words, He did not allow the fool with whom He was talking to drag Him down to His level by playing the same sinful communication games as His opponent. What He did do when responding to foolish verbiage was to show the fool his own foolishness. Your motives for responding to your child's manipulation should be righteous. You should examine your own life for any sinful words, actions, and attitudes (especially manifestations of the same basic tendencies of disrespect and manipulation). ➵ Maintain a spirit of gentleness. 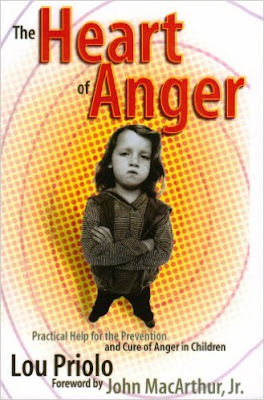 It is possible for righteous anger and sinful anger to reside in your heart at the same time. Before you open your mouth to reprove your manipulating child, you had better be sure that any anger you may feel in your heart is due to his sin against God rather than his sin against you. And, if you are certain you can speak out of such righteous anger, you had better take heed that such anger does not express itself in sinful forms of communication. Such as harshness, sarcasm, raising your voice, criticism etc. ➵ Choose the right words. You must speak the truth in love. You must select words that communicate grace and that will meet the needs of your child, for the purpose of edifying him.